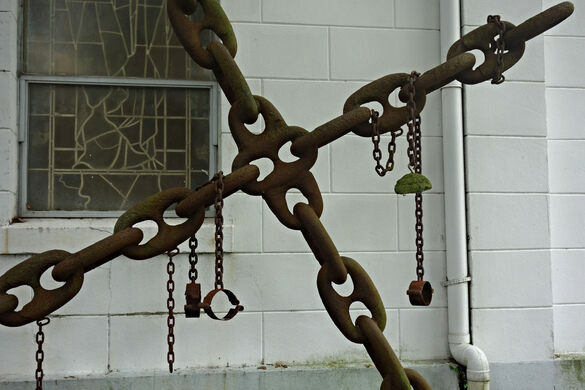 Resting next to one of the walls of the St. Augustine Catholic Church of New Orleans is a rusting cross made of thick chains. Medieval metal shackles hang from the length of it, while smaller crosses are planted in the ground around their larger brethren. This is the Tomb of the Unknown Slave. During the grimmest days of the slave trade, a number souls were the victim of violent, criminal deaths, being buried unmourned in unknown numbers, just to be discovered by modern construction efforts. Installed in 2004, the grim, rusting monument standing outside the church honors those countless slaves who perished uncounted and unnamed. As the bronze plaque affixed to the wall behind the shrine explains, the monument was primarily inspired by the number of unmarked graves that have been unearthed in the city over the years, but is also dedicated to all of those who died ignominious fates during the American slave trade. The plaque even points out that it is likely that there are such graves even in the earth beneath it since much of the parish was created by slave labor. While no one is actually (officially) buried beneath, the cross is a constant and haunting reminder of the legacy of oppression that led to America’s modern prosperity. It may not be the most uplifting memorial in the land, but it is most definitely nice to know that these poor souls are remembered, even without their names.